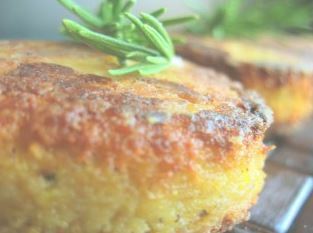 Cheese and herb polenta cakes: Polenta is a corn meal and therefore perfect for those following a gluten free diet. 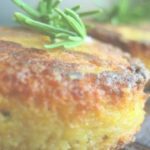 There are quick-cook forms of polenta on the market however, cooking real polenta from scratch and forming it into these wonderful cheese and herb polenta cakes, is much more satifying. Serve beside your favourite entrée. In a large saucepan over a medium to low heat, add the olive oil, butter, garlic, all the herbs and red pepper flakes. Cook for 2 minutes, then add the stock and half ‘n’ half and bring to a boil. Add the polenta and slowly bring to a boil, stirring constantly. Continue cooking for up to 30 minutes, stirring regularly until the mixture is very thick and the polenta is tender. If it seems to be cooking too quickly, simply add more water, a little at a time. 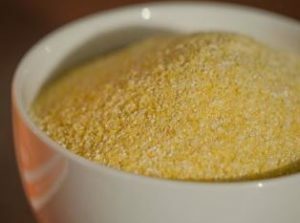 Remove from the heat and stir in the Parmesan cheese and check the seasoning. Pour into a baking dish and smooth to level it and allow it to set in the fridge overnight. Use a cookie cutter to cut into rounds. Dust them lightly in flour and fry until golden brown on both sides. Serve drizzled in your favorite pasta sauce, which is only limited to your own imagination.